Facebook’s $1 billion data center in Los Lunas in New Mexico will benefit from an additional 100 megawatts (MW) of new solar capacity after approval was granted for the construction of two 50 MW solar farms, ensuring that the data center is served with 100% renewable electricity. Announced back in September of 2016 and expanded during construction late last year, Facebook’s Los Lunas data center in New Mexico is expected to bring its first two buildings online later this year while construction continues through to 2023. 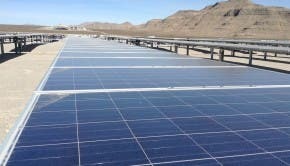 In an effort, therefore, to ensure that the data center remains true to its vision of being powered entirely by renewable electricity, US energy company PNM Resources, through its New Mexico utility PNM, has received approval from the New Mexico Public Regulation Commission (NMPRC) to purchase 100 MW of solar electricity from NM Renewable Development (NMRD). Announced last week, NMRD — a joint venture between subsidiaries of PNM Resources and American Electric Power — will build two 50 MW solar PV generation facilities in New Mexico — the first of which will be completed and operation by the end of 2019, followed in June 2020 by the second facility. Together, the two facilities are expected to bring $140 million worth of new investment to New Mexico and create approximately 200 construction jobs. The move comes seven months after PNM was approved for three Power Purchase Agreements by the NMPRC worth a total of 266 MW to power the expansion of Facebook’s data center — the electricity coming from a mix of wind and solar facilities to be built across New Mexico. For Facebook, the move ensures the company remains on track to meet its recently announced target of powering 100% of its global operations with renewable electricity and reducing its greenhouse gas emissions by 75%, all by 2020.